In this page we show (Antonio Silveira) a preliminary and cumulative birds checklist of Atibaia. 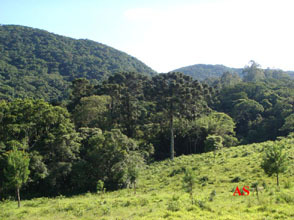 In special from Reserva Ecológica do Vuna, a private Reserve, with 330 ha of preserved Atlantic Forest, which is nearSerra do Itapetinga, Atibaia County, São Paulo State. This list is the result os our observation in 02/09th/08, 12/06th/08 ,01/10th/09, and 11/08th/2014. all in the morning period, in a total of 15 hours of field work. The observations were done with binocles, recorders and film recorders, in the green, red and rose tracks in the reserve. there were also provided many observations around the Reserve. Vuna Ecological Reserve is covered with rainforest in advanced state of recuperation, with around 1,200 meters high. Up to now we already registerd 131 species, that follows.